Instant Pot Vegetable Curry. Loaded with lots of seasonal vegetables, a good mix of Indian spices, then bulked up to make the best ever healthy vegetable curry freezer meal. I was in the middle of batch freezing lots and lots of healthy curries for a quick weight loss that I wanted before Christmas. I had done lamb rogan josh, chicken korma, chicken Balti, along with plenty of vegetarian curries. But what got me thinking is that I had been waiting all day for them to cook in the slow cooker and surely the Instant Pot would be a better option instead???? So, that’s what I did. I made a big batch of my vegetable curry but in the pressure cooker. I made so much vegetable curry in the Instant Pot that it was almost touching the max line which is very rare for us. I then got the ladle and poured it into my favourite freezer containers. Without much pre-planning I had made enough healthy vegetable curry for 10 freezer meals. Just like that! Even better….the cooking time was just 6 minutes. YES ITS NOT A TYPO 6 whole minutes for making a huge batch of vegetable curry. Prepping took a little longer, but not too much and I have all these lovely portions of curry to help me lose weight before Christmas! Making an Instant Pot Vegetable Curry is just so simple, that you will wonder why you never made them years ago. You simply throw in all the vegetables that you want to use, add your seasoning and stock and let the Instant Pot do the hard work. Then at the end partly blend and you have creamy vegetable curry. Then add to this that you have a HUGE batch of vegetable curry that you can portion up into freezer bags and it makes it magical. What I did was wait for it to cool down and then added all the spare portions into my chest freezer. There was enough to live off vegetable curry for a few days if you wanted to, or just save them for next time you fancied a bowl of warming vegetable curry. I also love Instant Pot Vegetable Curry as a money saver. If you find some vegetables in the bottom of your fridge that need using up before they end up in the bin. Or buy a grocery deal on vegetables then it is a must to throw them all in and make a magical vegetable curry. Or do you have a family member that hates curry and you love it. Well when they are having something you hate, then you can get a freezer portion from the freezer and eat your vegetable curry instead. The Instant Pot – It must start with our Instant Pot Duo that makes this recipe fast. It also steam cooks the vegetables rather than boiling them which keeps their amazing taste. If you’re on the fence about getting an Instant Pot then read our vegetable curry recipe and see how simple batch cooking can be with the Instant Pot. Freezer Containers – We’re currently in love with getting some glass bottom with plastic top food containers. We can then batch freeze our vegetable curry and then take the lid off to warm them up in the oven on another day. Plus, don’t forget to subscribe below to join our email newsletter with updates of our latest recipes, latest freebies, our cooking stories, plus much more. This Pressure Cooker Vegetable Korma is featured in The Fat Free Curry Cookbook & Healthy Freezer Meals. Which is a collection of favourite Indian curries and side dishes. It also includes information of how to bulk cook healthy curries for the freezer. In fact, we made more than 50 curry freezer meals in JUST 1 hour! If you love a delicious pressure cooker curry and love eating healthy, then this is for you! 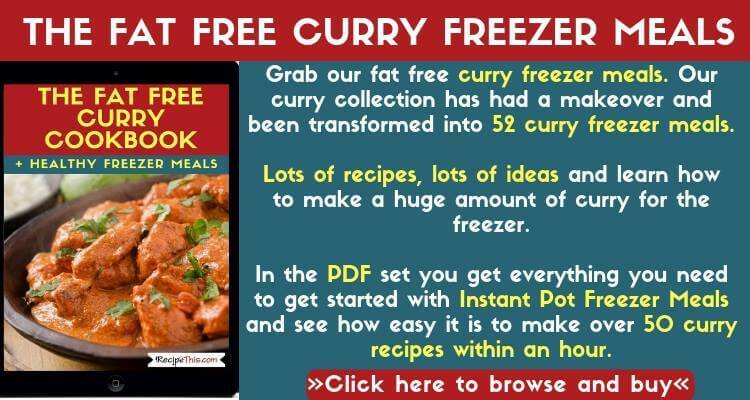 Click on the banner below for full details as well as which other curries have been transformed into Instant Pot Pressure Cooker Freezer Meals.